The problem with this chart, however, is that sales levels can be volatile (we saw an example of this when we looked at historical data for home inventories, specifically). So while sales to inventory levels could look low on this chart, if sales are unusually high and subsequently correct, there will be abrupt changes to this chart, as is the case in the latter half of 2008. Taken together, however, the two charts suggest that while absolute inventory levels are going in the right direction (to lay the groundwork for future output to be required), demand is so low that sales to inventory levels are still high. Until this number reduces substantially, businesses will have no need to increase output, and thus the economy will remain stagnant. While the government attempts to spur demand to encourage output increases, it remains to be seen whether this effort will be substantial enough to have the desired effect. 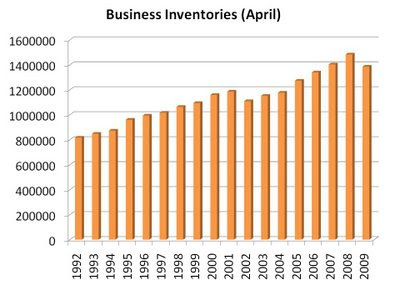 We may instead just have to wait for these inventory levels to come down before they can go back up.